Corey Winchester, a history and social sciences teacher at Evanston Township High School. Winchester was selected as a finalist for the Golden Apple Award. 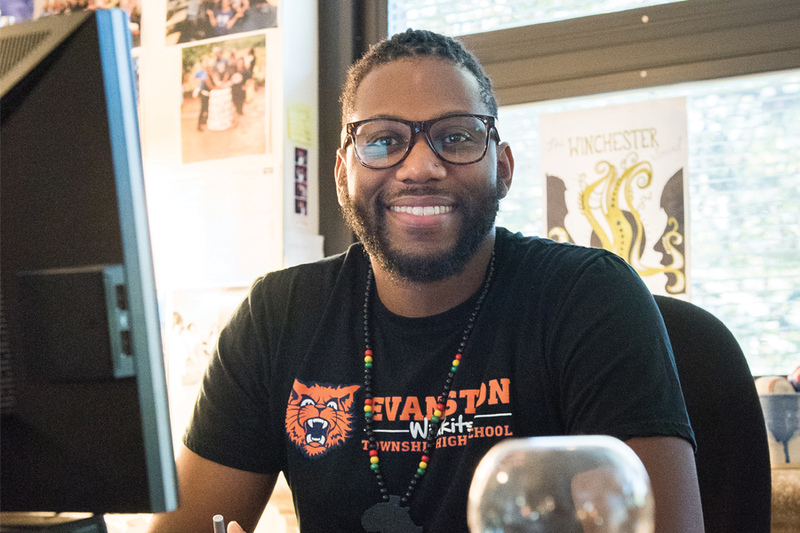 Corey Winchester, a history and social sciences teacher at Evanston Township High School, was selected as a finalist for the 2019 Golden Apple Award for Excellence in Teaching, according to a news release from ETHS. Winchester is one of 32 high school teachers across Illinois selected as a finalist for the award. The Golden Apple Award recognizes teachers across the state who have positively impacted their students’ lives through their teaching. The organization also works to develop teachers as leaders to improve education statewide. Eric Witherspoon, the superintendent at ETHS, said Winchester has been a “standout teacher” since he started teaching at the school in 2010. Winchester was also selected for the Teach Plus Illinois Teaching Policy Fellowship for the 2018-2019 school year. He is working with 19 other Illinois teachers to improve policy and practice in education. Winchester’s work specifically focuses on recruitment and retention of teachers of color. Finalists will be recognized at the Golden Apple Celebration of Excellence on Feb. 23. Award recipients will be notified with surprise school visits in the spring.